The purpose of this guide is to help assess the difference between normal aging processes and ADD as the cause for certain presenting symptoms. This guide describes assessment methods and treatment modalities, which can be used for older adults by non-gerontologically trained professionals. Techniques for differentiating between other disorders and ADD are included in this guide. Unique characteristics presented by older adults with ADD are discussed and compared to younger adults with ADD. 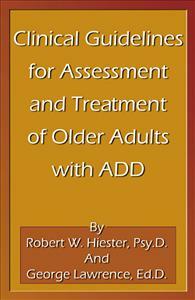 Coping skills, which often mask the symptoms making assessment very difficult, are addressed and treatment methods applicable to older adults with ADD are presented in this guide. Additional sources of information on ADD and support groups are presented in the appendices.